Not to be confused with Peter Jackson's glorious 1992 splatter movie parody Braindead, Brain Dead (two words rather than one here) is an 2007 American film from b-movie horror specialist and Witchboard director Kevin Tenney, one that also seeks to parody 80s splatter movies and that has found some favour amongst genre devotees. Two escaped convicts, two attractive lost hikers, a televangelist and his pretty young assistant all find themselves in the unusual (except in horror films) predicament of being trapped in a deserted fishing lodge with a host of alien-infected, mutant amoeba controlled zombies at their doorstep. A random meteorite falls to earth and accidentally hits small town fisherman Bill in the forehead, leaving a marble sized wound in his skull. As his friend and fellow fisherman Ben tries to help him, the meteorite dissolves into an oil-based, gelatinous alien life form which seeps into Bill's brain, turning him into a cannibalistic zomvie. Bill's eyes then snap open and he attacks his friend, ripping Bob's brain from his skull and devouring it. A while later Sydney Moyes, a local Forest Ranger, finds the remains of one of the fisherman from the lodge and investigates, leading to a violent gunfight with Bob. Sydney gets the drop on Bob but before she can shoot him a monstrous, humanoid creature attacks her and devours her brain. When they discover the missing fishermen have been decapitated, the disparate group are forced to put aside their differences and to work together to try and escape. With alien-controlled zombies stalking the woods the shelter they sought earlier may now become their tomb. 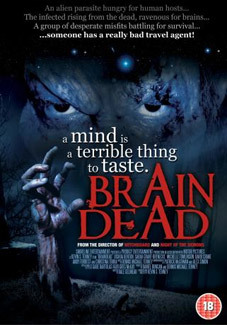 Brain Dead will be released on UK DVD on 21st February 2011 by ISIS Ltd. through Eureka Entertainment at the RRP of £15.99. The only included extra is a Behind the Screams making-of featurette.